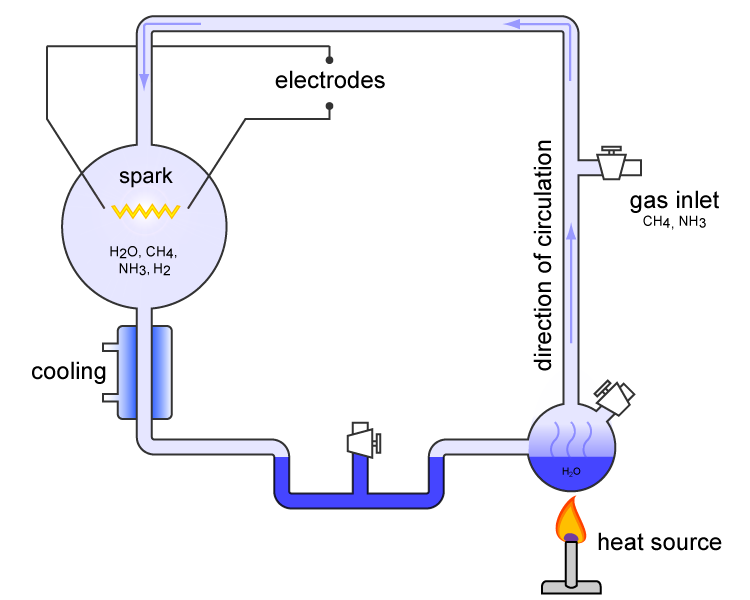 The Miller-Urey experiment was an experiment that simulated hypothetical conditions present on the early Earth in order to test what kind of environment would be needed to allow life to begin. The experiment is considered to be the classic experiment on the origin of life. It was conducted in 1953 by Stanley L. Miller and Harold C. Urey at the University of Chicago. The experiment used water (H2O), methane (CH4), ammonia (NH3) and hydrogen (H2) - materials which were believed to represent the major components of the early Earth's atmosphere. The chemicals were all sealed and circulated inside a sterile array of glass tubes and flasks connected together in a loop, with one flask half-full of liquid water and another flask containing a pair of electrodes. The liquid water was heated to add water vapour to the chemical mixture and the resulting gases were circulated around the apparatus, simulating the Earth's atmosphere. The flask with heated water represents water on the Earth's surface and the recycled water vapor is just as water evaporates from lakes and seas, before going into the atmosphere and forming into rain. Sparks were fired between the electrodes to simulate lightning storms (believed to be common on the early earth) through the water vapors, and then the vapors were cooled again so that the water could condense (simulating the oceans) and trickle back into the first water flask in a continuous cycle. At the end of one week of continuous operation, Miller and Urey observed, by analyzing the cooled water, that as much as 10-15% of the carbon within the system was now in the form of organic compounds. Two percent of the carbon had formed amino acids, including 13 of the 22 that are used to make proteins in living cells, with glycine as the most abundant. The molecules produced were simple organic molecules, far from a complete living biochemical system, but the experiment established that the hypothetical processes could produce some building blocks of life without requiring life to synthesize them first. The Miller-Urey experiment inspired many experiments in a similar vein. In 1961, Joan Oró found that amino acids could be made from hydrogen cyanide (HCN) and ammonia in a water solution. He also found that his experiment produced a large amount of the nucleotide base adenine which is one of the four bases in RNA and DNA. It is also a component of ATP, which is a major energy releasing molecule in cells. Experiments conducted later showed that other RNA and DNA bases could be obtained through simulated prebiotic chemistry (deals with origins of life: how the first molecular building blocks of life were formed and self-assembled into replicating systems) with a reducing atmosphere (an atmosphere characterized by little or no free oxygen but contains hydrogen or hydrogen-containing compounds such as methane or ammonia - the atmospheric conditions believed to be on early Earth). There have been a number of objections to the implications derived from these experiments. Some scientists believe that Earth's original atmosphere might contain less of the methane (CH4) and ammonia (NH3) molecules (reducing molecules) as was thought at the time of Miller-Urey experiment. But other experiments maintain that the early atmosphere of Earth could have contained up to 40 percent hydrogen - implying a much more hospitable environment for the formation of prebiotic organic molecules. The escape of hydrogen from Earth's atmosphere into space may have occurred at only one percent of the rate previously believed based on revised estimates of the upper atmosphere's temperature. In this new scenario, organics could have been produced efficiently in the early atmosphere, leading us back to the organic-rich soup-in-the-ocean concept. This studies make the experiments conducted by Miller-Urey and others relevant again. Another objection is that Miller-Urey Experiment required a tremendous amount of energy. Although lightning storms are thought to have been very common in the primordial atmosphere, they are not thought to have been as common as the amount of electricity used by the Miller-Urey experiment implied. These factors suggest that much lower concentrations of biochemicals would have been produced on Earth than was originally predicted (although the time scale would be 100 million years instead of a week). Conditions similar to those of the Miller-Urey experiments are present in other regions of the solar system, often substituting ultraviolet light for lightning as the driving force for chemical reactions. On September 28, 1969, the Murchison meteorite that fell near Murchison, Victoria, Australia was found to contain over 90 different amino acids, 19 of which are found in Earth life. Comets and other icy outer-solar-system bodies are thought to contain large amounts of complex carbon compounds formed by these processes. The early Earth was bombarded heavily by comets, possibly providing a large supply of complex organic molecules. This could imply an origin of life outside of Earth, which then migrated here. However, before you start, please pay notice that chemicals and electricity could be sometimes dangerous, when not given appropriate care, can harm you. As a rule: this experiment should be performed under the supervision of teachers or adults familiar with chemistry and electrical safety procedures. Consult your teacher or other knowledgeable adults and experts about how to obtain the mentioned materials and supplies and how to use them properly and safely in these experiment. Do not do this experiment alone! Notify your parents and school authorities before you begin - wait for their approval. If you have decided to embark on this challenge, before you begin, consult the link section of this page and further resources provided. Ensure that you understand the basic principals. Surf the web further and consult your local library, your teachers and other knowledgeable adults and experts.